You’re much more likely to see a kiddo standing on a horse in physical therapy. So what’s kiddo Jackson doing in this position during occupational therapy? All kinds of things! By changing Jackson’s base of support, movement patterns, and height in relation to his surroundings, Miss Leah is challenging his vestibular system, visual flow, and body awareness. All of that sensory input comes together to increase Jackson’s level of alertness which helps him be more engaged in – and get more out of – his work and play. Working in this posture is also helping Jackson become more independent. At present, his walk is a little too unsteady for him to comfortably transition from one surface to another, so he tends to drop to his hands and knees and then crawl. By standing while the horse is in motion(! ), Jackson is building the core and lower extremity strength that will help him be able to walk across the threshold of a door, up a step, or from carpet to tile so he can reach his toys and buddies more easily. Of course, as you can see from Jackson’s big smile, he has no idea how hard he’s working. How lucky are we to be able to provide medical treatments that make such a difference for kiddos and that the kiddos love. So lucky. Our smiles are just as big as Jackson’s. 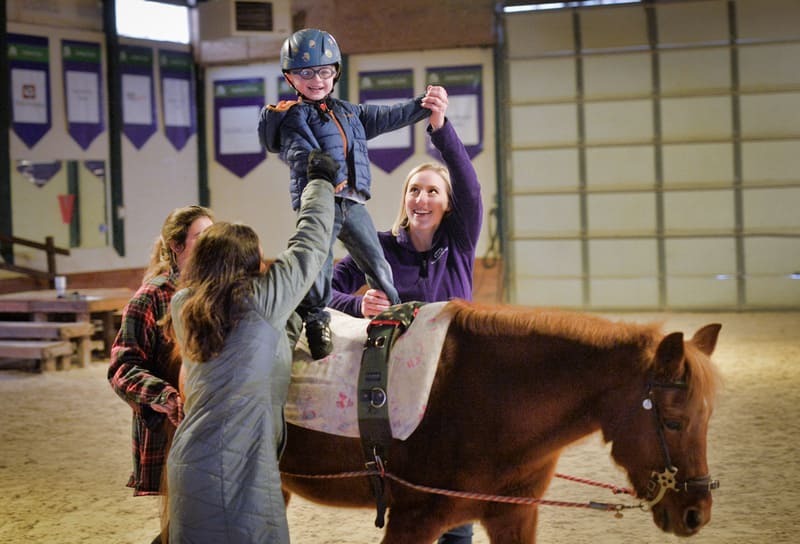 Learn more about hippotherapy and how it's a huge help for kiddos who have special needs. Neigh your season be filled with joy!